There's a reason why people bake cookies in houses before an open for inspection - that smell is magic. But these cookies don't just smell magic, they taste it too. They're also secretly paleo and vegan - meaning that, in the world of cookies, they're pretty much a unicorn. They're also a favourite of my cookie monster of a husband. You see, Jesse loves any cookie - but he especially loves soft cookies with crisp edges and lots of gooey chocolate chunks. 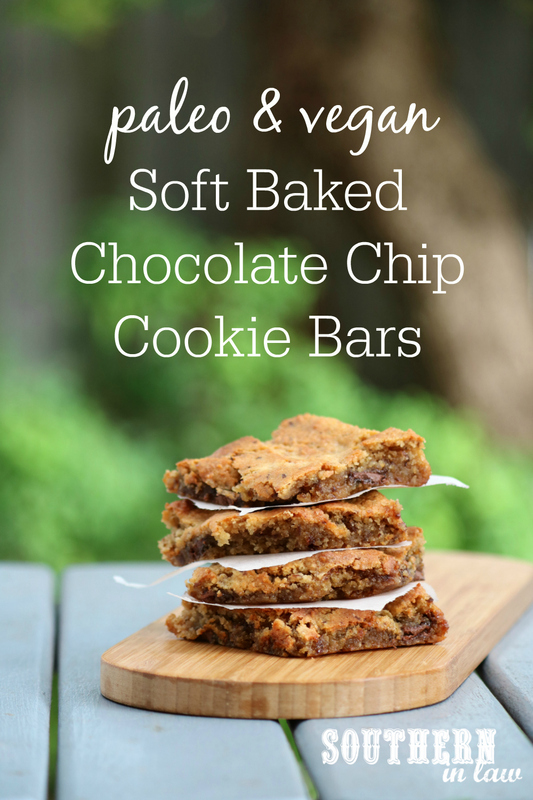 These cookie bars were created with him in mind - and they became a fast favourite of mine too. They're soft and gooey with crisp, chewy edges - and you'd never guess they were made with no grains, no gluten, no animal products and no refined sugar. Even better? 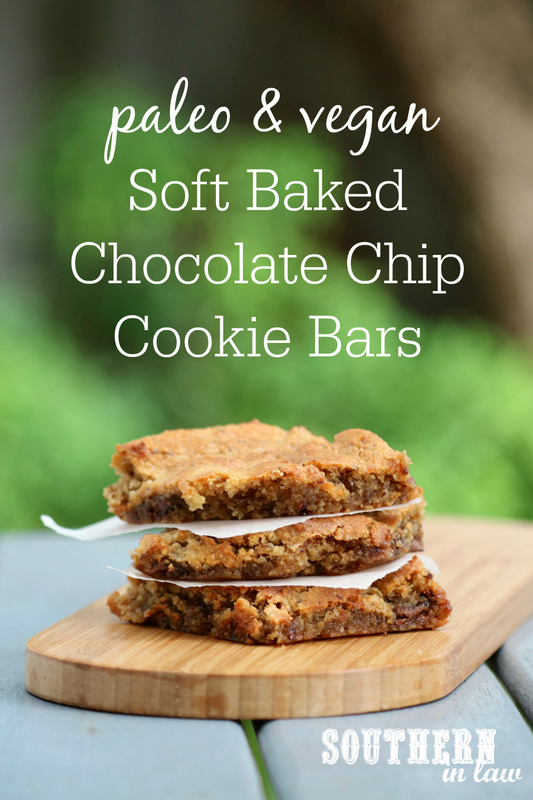 Following the "lazy cook" theme of this week, these cookie bars are ridiculously simple to make. All you need is one bowl, one mixing spoon, one pan and half an hour of your time and whaddayaknow, you've got a batch of warm cookies at your disposal. dairy free, refined sugar free, healthy, paleo and vegan. In a mixing bowl, combine your nut butter, maple syrup, applesauce and salt until combined. Add in your almond meal, flaxseed and baking powder (and coconut flour, if using) and stir until combined. 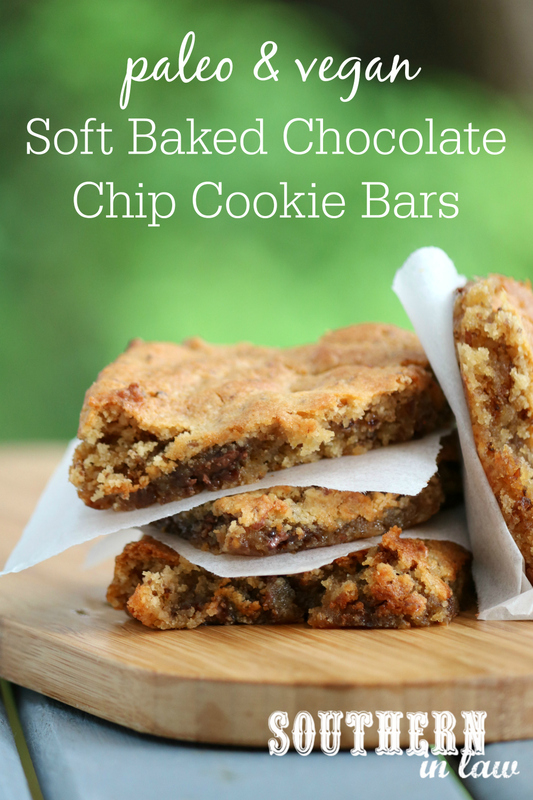 Mix through your chocolate chips/chunks and pour the mixture into your prepared baking dish. Bake for 15-20 minutes or until your edges are firm and golden. 15 minutes will give you extra soft bars whilst cooking them for longer will give them a chance to firm up a little more. Allow to cool before removing from the tin and slicing. 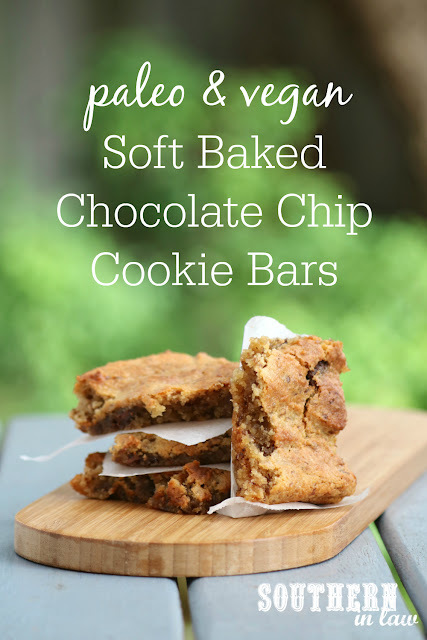 These cookie bars will keep in an airtight container at room temperature for 2-3 days, however, are best eaten on the first day as they will soften slightly. *We often use peanut butter as it makes a delicious peanut cookie slice, however, we've also used almond butter, sunflower seed butter and cashew butter. You can use natural or processed nut butters (with added oil/sugar etc). **This recipe makes deliciously soft cookie bars, however, if you want a firmer cookie you can add 1-2 tbsp coconut oil - or just as much as needed to bring your mix together into a firmer cookie dough. But tell me, what's some of your favourite "food smells?" I love the smell of garlic and onion cooking but Jesse hates it.